Having no luck in love? You’re certainly not the only one. But this hapless single lady came up with a most radical — or perhaps practical? — solution to end her spinsterhood. Not to be outdone by Miss Heintz, these men have done some shopping of their own, finding lasting companionship in mail-ordered, custom-molded masses of silicon. A true tale of serendipity, just when this woman thought her ex-husband was gone for good, he unwittingly moves in right next door — to her and her new husband. If you need a date for Sunday you might want to make your way to a special Burger King in Queens for a quick visit with the most unlikely — but successful — of matchmakers. In a tragic twist of fate, just days after this self-described “neurotic, struggling filmmaker” said her vows, the love of her life was gone forever. They say “love hurts” and this contributor can actually tell you the precise amount of pain it can cause. They also say “great things come in small packages” and that “love is found in the most unexpected places.” One of our features editors concurs with both of those statements in her love letter to coffee. Being in a long-term relationship brings its fair share of challenges, but this couple had to travel great lengths — quite literally — to finally find some peace of mind. When the events of a most infamous day in American history upend their lives, this dynamic duo had to wait quite a while for the calm and comfort of traditional romance. 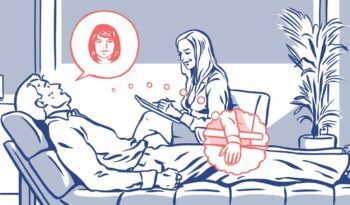 For weeks this anxious psychotherapy patient pined for his super-attractive therapist — and then got the unexpected chance of a lifetime with her.